Hepatocellular adenoma is one of the benign tumors which may occur in the liver. Solitary adenoma is more frequent in women, especially associated with the use of oral contraceptives or anabolic steroids. Glycogen storage disease and mutation of HNF1A gene are associated with an increased incidence of adenomas. It is usually asymptomatic and found incidentally. MRI is used to suspect the diagnosis which should be confirmed by liver biopsy. Recently, adenomas have been usually divided in four types with different characteristics (Bordeaux classification): adenoma with HFN1A gene mutation, adenoma with B-catenin gene mutation, adenoma without any markers, and inflammatory adenomas. It has been reported with an increasing risk of bleeding (up to 25 %) or tumor transformation (up to 9 %) based on histologic classification (B-catenin mutation) and size. Surgical resection is usually recommended in case of tumor size larger than 5 cm, B-catenin mutation, presence of symptoms, evidence of dysplasia or atypia at the biopsy, or features of malignant transformation (increase size at the follow-up). Early postoperative outcome after partial hepatectomy has been reported excellent as well as long-term results. 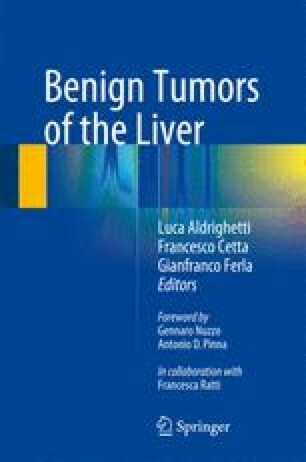 In case of adenomatosis (more than ten adenoma), surgical resection of the greatest lesions may be recommended; however, liver transplantation may be considered in case of diffuse disease, and it has been reported as an exceptional indication in 0.09 % of all indications in the world.